Wild Bird Food: What Bird Seed Do Birds Prefer? What Bird Seed and Other Foods Do Birds Prefer? When it comes to wild bird food, there are lots of choices. Different seeds as well as feeders will attract different bird species. The more you know about which types of seed birds prefer, the better you will be able to attract the number and types of birds that visit your feeders. And better yet, the better you will be able to keep away nuisance birds from your feeders such as starlings, house sparrows, blackbirds among others, unless you want them at your feeders. Use the below wild bird food preference chart as a guideline and watch the video for more info about bird seed. 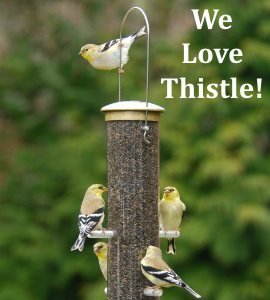 Below is a short video discussion below regarding use of wild bird seed mixes, black oil sunflower seeds, Nyjer thistle, safflower seeds and/or suet in your bird feeders. When purchasing wild bird seed, try to buy seed that is as fresh as possible. Some seed distributors work directly with farmers, grower co-ops and seed processors to deliver the freshest and most nutritious bird seed. This isn't the cheap seed at your local discount store that been sitting in a warehouse, has lost most of its nutritional value and is full of "filler" seed that birds don't like and pick through. In the long run, you save because there is less waste and even more importantly, it's better for the birds. We've got a whole page on how to make your own hummingbird nectar, much cheaper than store-bought and better for the hummingbirds without the artificial color. Now that you know about they types of wild bird food, learn how to build your own feeder with these Free Bird Feeder Plans and learn which type attracts what kind of birds. Winter Bird Feeding- Learn about the best bird seedfor the birds during the cold wintertime season. And be sure to sign up for Project FeederWatch, where you can participate in a winter-long survey of birds that visit your feeder. Bird Feeders - Best bird feeders by type including tube, platform, squirrel proof, hopper and window bird feeders.